This is a additional key for the adjustment hinges which are on the opposite side of the affected compartment. The DonJoy CE2000 Neoprene Undergarment is available in Black Only. Undersleeve length is 19" long. Used to provide greater friction between skin and brace. The undergarment also provides warmth and compression. This is an important consideration for those patients prescribed a Donjoy brace with sensitive skin. Easy wash it protects the skin and fits like a glove. Choose the size according to your patient's brace size. DonJoy Lycra® Undergarment is available in Black Only. Undersleeve length is 19" long. If you have sensitive skin over your knees these are great for any of the Donjoy knee brace range! They are a lighter option than the Floam. The Kit comes with one Chamois pad. The pads that came with your Donjoy brace can be peeled off and these attached with ease. If you have bony knees and need your brace for sport these are a god send! They are a lighter option than the Floam. The Kit comes with 2 air cushioned pads and black lycra covers. The pads that came with your Donjoy brace can be peeled off and these attached with ease. If you have bony knees and need a firm brace as with the Osteoarthritis Bracing range these are great! The Kit comes with one floam cushioned pad and a black lycra cover. The pads that came with your Donjoy brace can be peeled off and one of these these attached with ease to the side that you need to protect. A great tip from OrthopaedicsAndTrauma.com is that if you are sore but have no broken skin then you can put these floam pads in the refridgerator cool them down to 4 degrees and use them to reduce the inflammation around you knees. This pinch guard was developed for active skiing fanatics with the need for an ACL brace. The Calf Pinch Guard provides a smooth transition between boot and calf cuff of the Armor, Armor Forcepoint and Forcepoint braces. A good product for the skier. Useful when your patient complains of getting pinched between the top of the ski boot at the back of the calf particularly on the apex of a turn. This is an essential accessory for Motocross body armor and Endoro body armor. Make sure you choose the size that corresponds to your patient's Ligamant Knee Brace. This is a useful accessory suitable for the ForcePoint, Legend and the Armor. 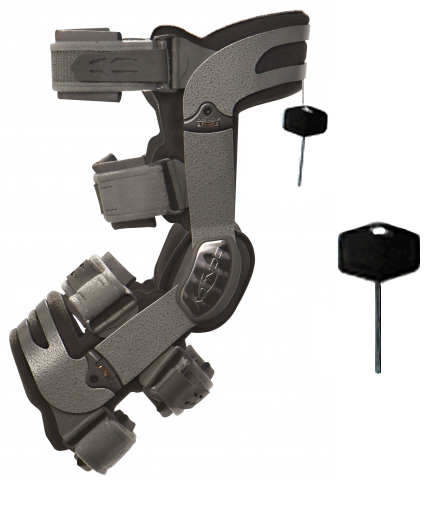 The picture shows the impact guard on a Donjoy Armor knee brace. Useful for cyclists and motocross fanatics. This is a useful cover worn outside the brace and the Impact guard for sports such as moto cross or mountain biking.This is the standard fitting suitable for the 4titude® Standard Length, the Donjoy Legend and the ForcePoint. OrthopaedicsAndTrauma.com have to order the DonJoy® Legend CI Knee Brace Replacement Frame Liners in as a special order from the USA. This means they can take between 1 - 3 weeks depending on availability. The kit contains only new frame liners. Please check the size and side of the brace before making a choice and click off the drop down menu before rolling your mouse wheel!